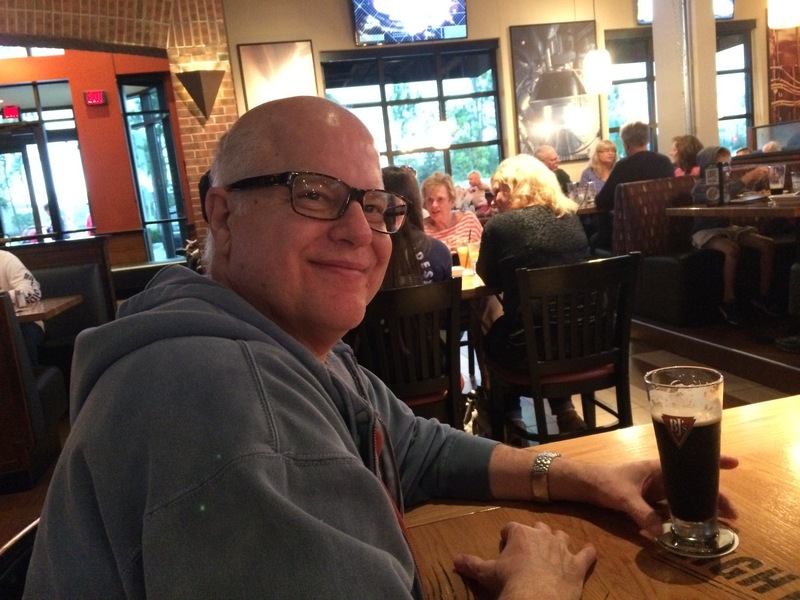 The latest quest for a fabulous meal took me and my group of friends to Sarasota, FL. 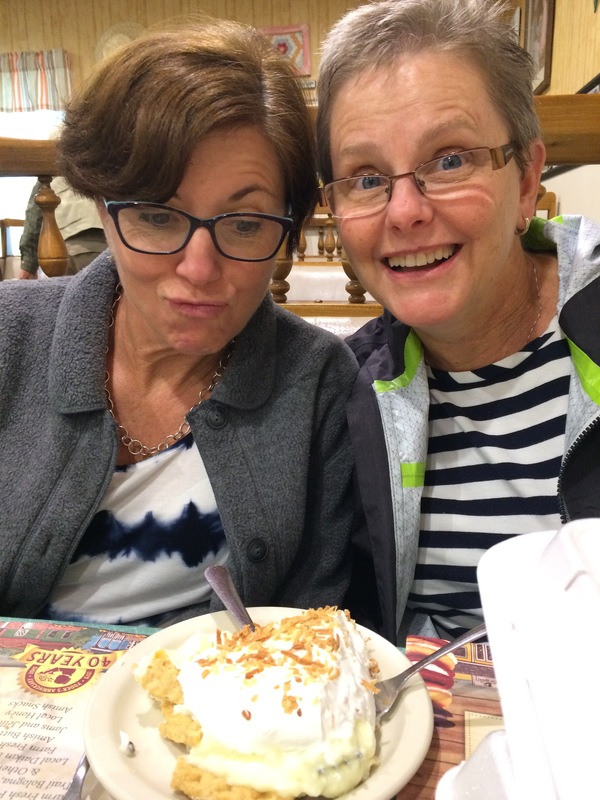 It was Val’s choice this month and she picked Yoder’s Amish Restaurant. 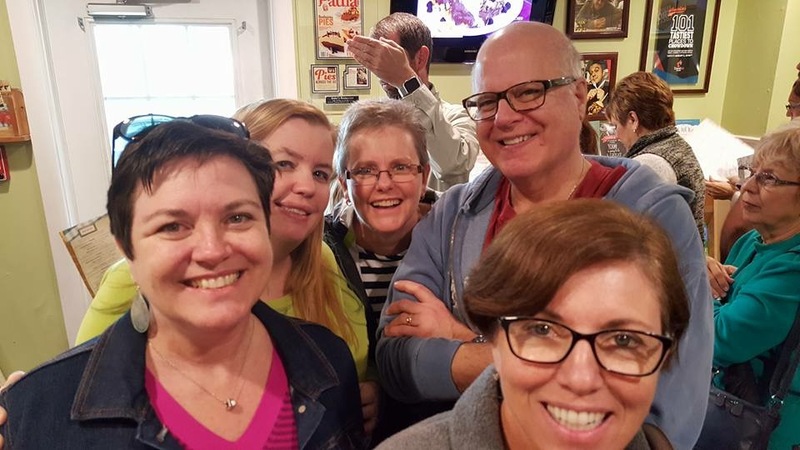 There were seven of us this time: Tammy, Di, Val, Cary, Kosta, me, and Kim, our newbie, who is a good friend of Val. 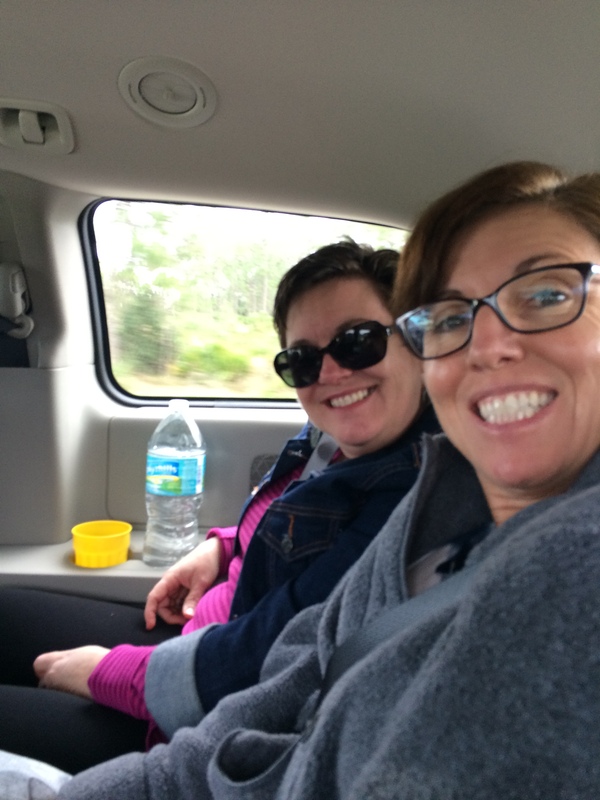 Tammy believes taking multiple cars is “unacceptable” so we rented a van for the day to accommodate all of us, because no one can say no to Tammy. At least not when she rolls out the “unacceptable” tactic. How can you say no to that smile? Yoder’s Amish Restaurant was profiled on Man vs. Food and you can watch the episode here. 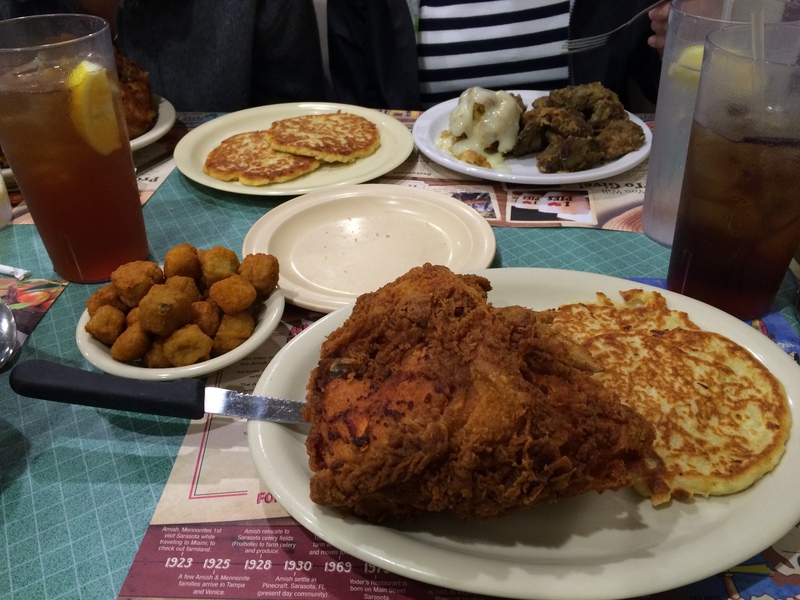 It was raining and cold, and the perfect day for some comfort food. And let me tell you, the place was PACKED. We stood in line for 20 minutes for a table. Ooh, check out the guy doing the un-photo bomb in the back. 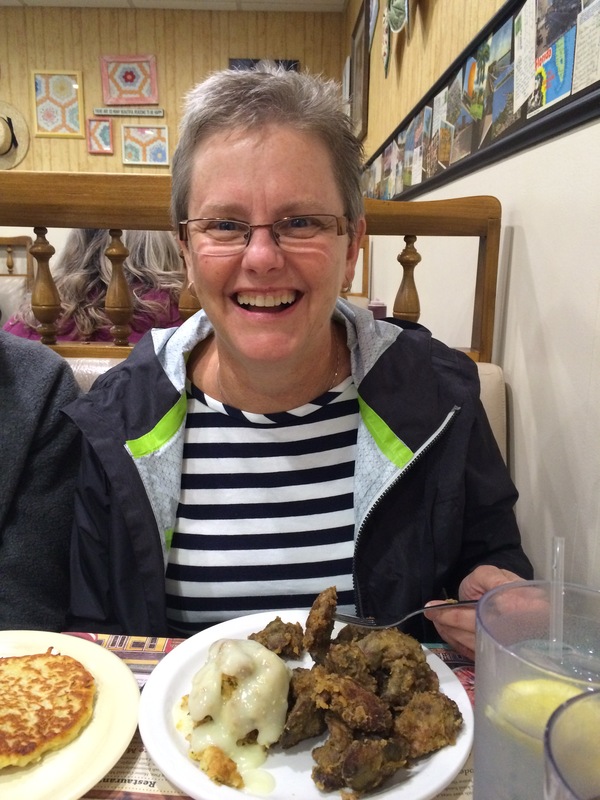 Di and her chicken livers. 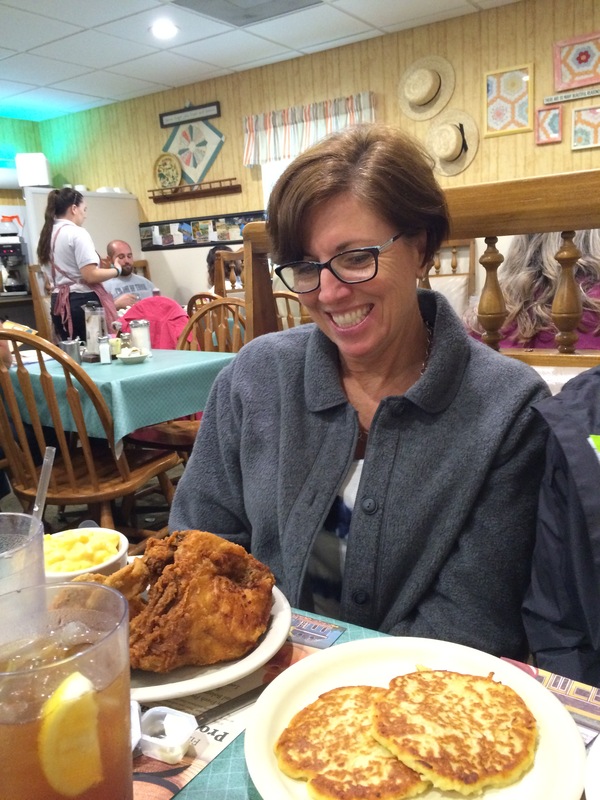 Tammy with fried chicken and mac and cheese. 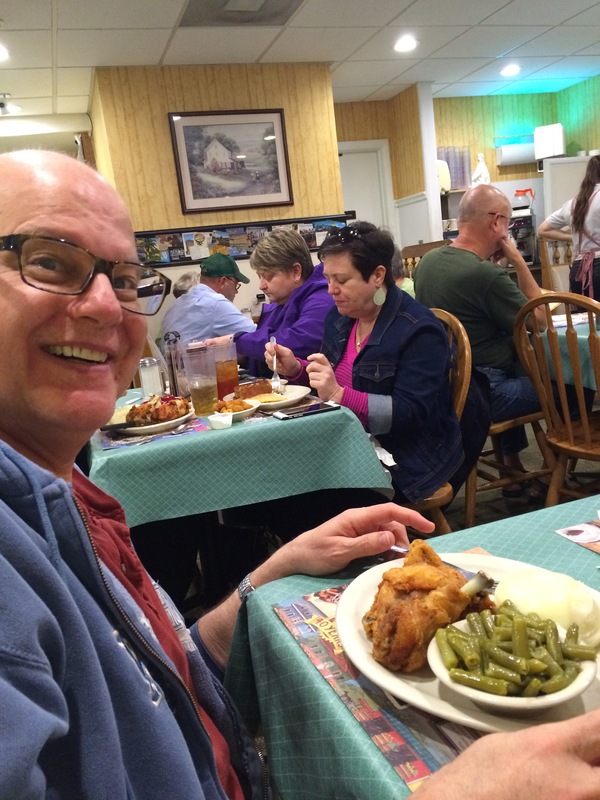 Kosta with fried chicken, mashed potatoes and gravy, and green beans, and Val across the way with meatloaf, fried okra, and mashed potatoes. 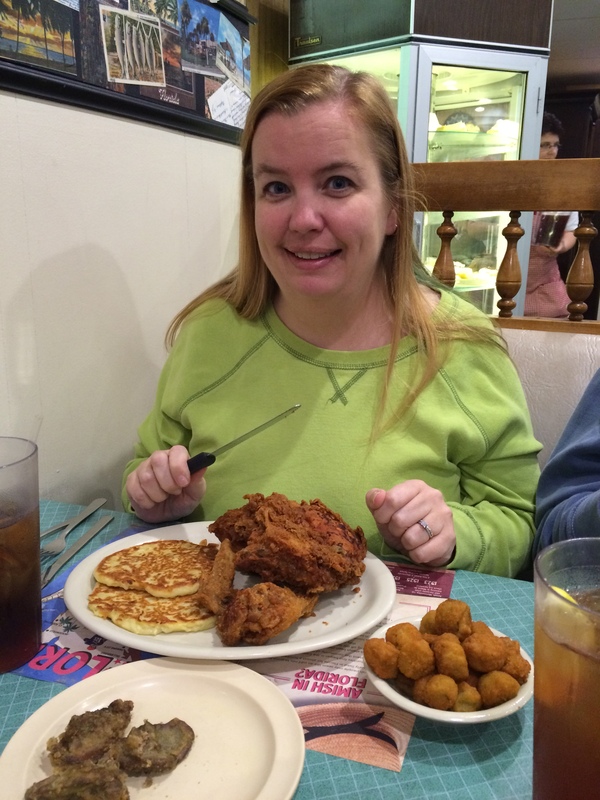 Yours truly with fried chicken, potato cakes, and fried okra. Let’s get a close up of that lunch, shall we? The chicken was amazing. 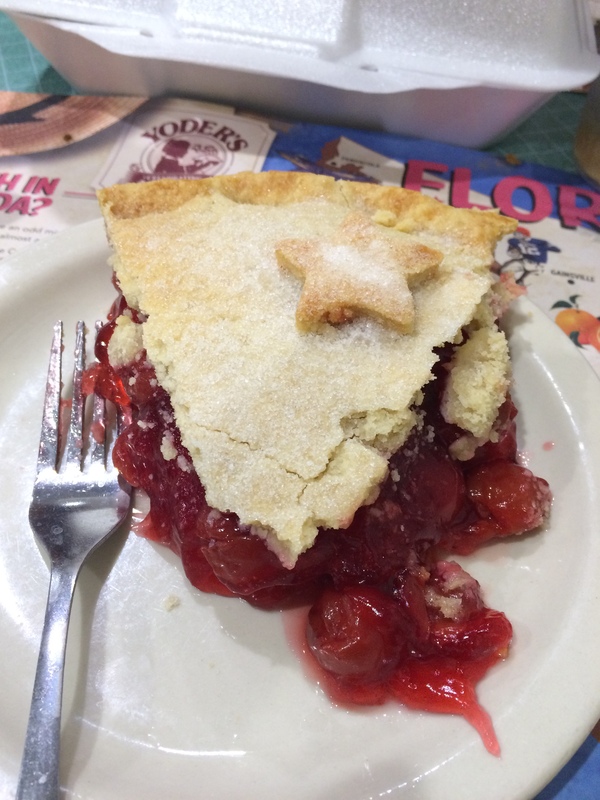 Of course, you can’t go to Yoder’s without having a piece of pie. Because it’s PIE. That is a slice of cokernut cream being shared by the Dynamic Duo. Afterwards we didn’t necessarily want to call it a day, but the weather was miserable so a few of the girls wanted to visit the HSN store. 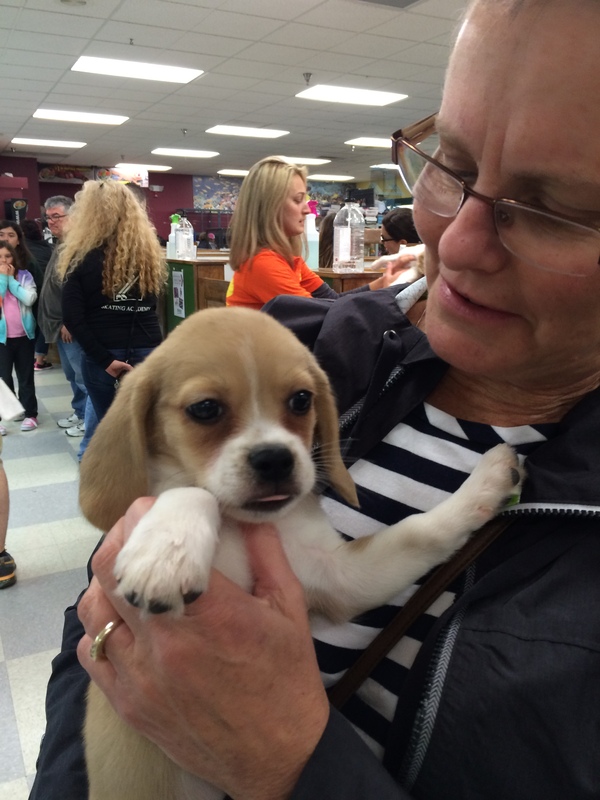 Some of us who are not so into shopping popped into the pet store next door where a puppy extravaganza was going on. Look at that adorable face. 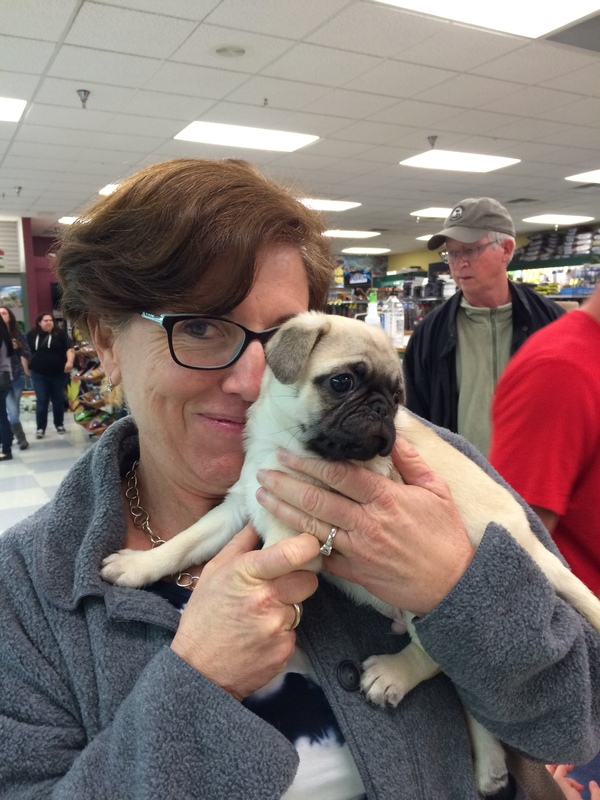 The pug is pretty cute too. Good heavens. Just rip my heart out and take it, will you? 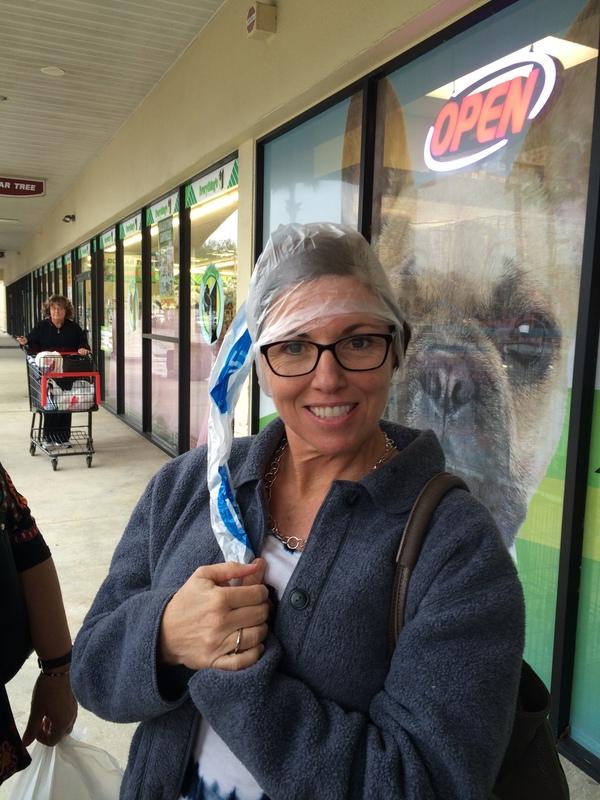 Tam’s fetching makeshift rain gear. 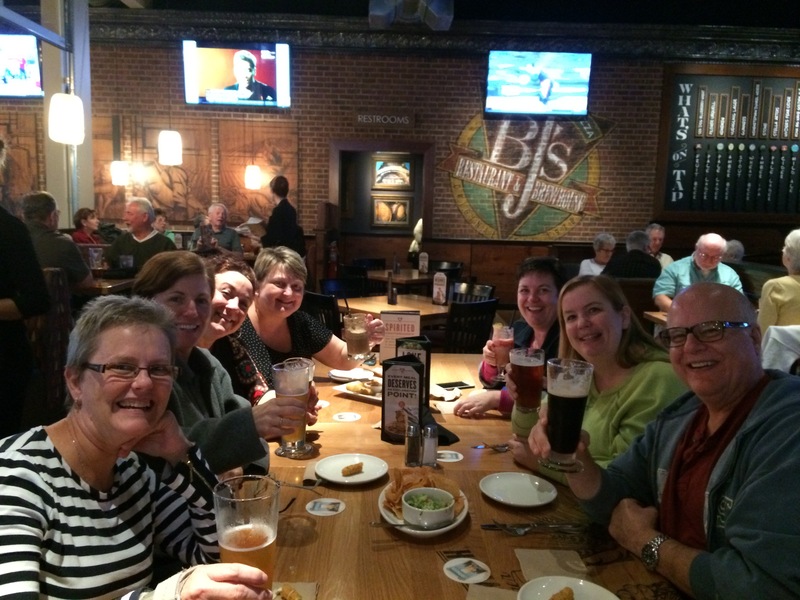 Finally, we decided to stop at BJ’s Brewhouse for a drink before calling it a day. We just wanted to sit at the bar but the staff wouldn’t let us pull the high top tables together and made us sit in the restaurant, where we took up two tables pulled together. The waitress was not happy that she was losing major tip money and was rather brusque. I can’t blame her, but for crying out loud it wasn’t our fault. The one nice thing the waitress did for us. Would you look at that handsome devil? Dear reader, I married him. Next month is Shorty’s BBQ in Miami. Stay tuned for another drool-fest of food! You make me drool, Pie, or as they say in Norwegian, pei.